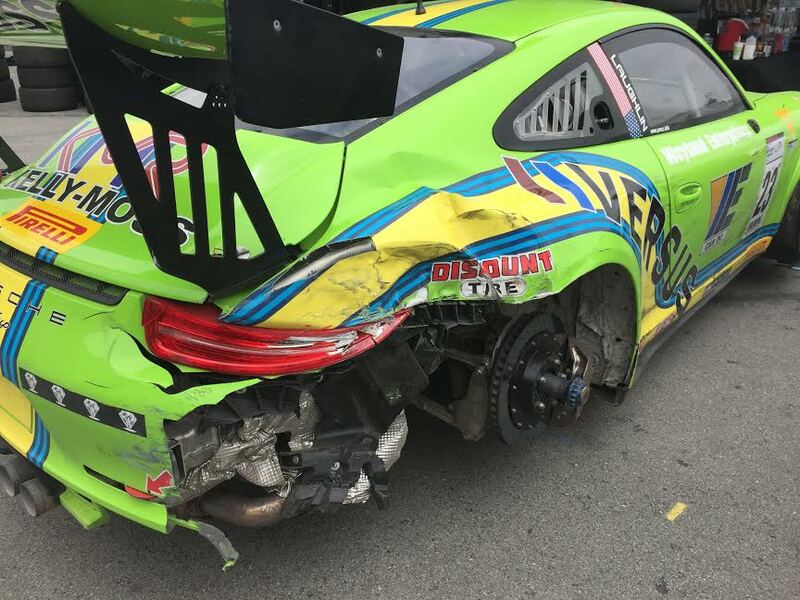 Monterey, Calif. – For the drivers and teams in the Pirelli GT3 Cup Trophy USA paddock, competition drives everything. But as three teams showed recently, that same competitive spirit also drives the camaraderie among them. Featuring a competitive field comprised entirely of Porsche racing machinery, Pirelli Porsche GT3 Cup Trophy USA is celebrating its 10th anniversary season and recently staged its largest field with nearly 40 cars at Mazda Raceway Laguna Seca. Unfortunately, the double-header race weekend was a tough one for series newcomer Pat Laughlin, whose Kelly-Moss Road and Race prepared Porsche 911 GT3 machine suffered damage in both rounds of competition, including a very significant contact in the closing moments of Race 6 on Sunday. 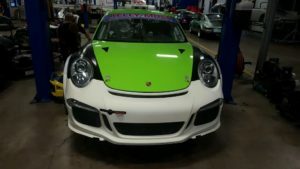 But thanks to the efforts of the same teams that he’s doing battle with in the championship, Laughlin’s Porsche should be ready to race when the championship meets again after his Kelly-Moss Road and Race squad was boosted by the efforts of two competing teams in Competition Motorsports and TruSpeed Autosport, who stepped in to help make sure he’d be back for the next race weekend. 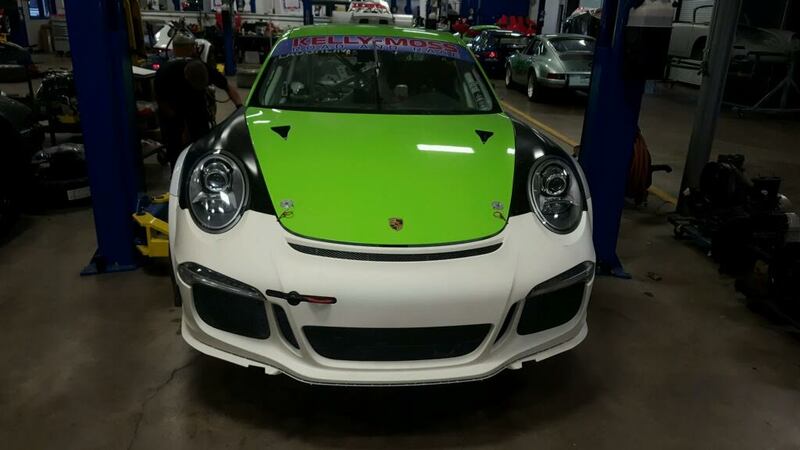 After much consideration of all the possible options, it quickly became clear to the Kelly-Moss team, which manages concurrent campaigns in Pirelli GT3 Cup USA as well as East Coast PCA competition as well as the international IMSA Porsche GT3 Cup by Yokohama, that the only real option was to get the machine back to its body shop at the team’s headquarters in Madison, Wisconsin. But the logistics were far from straightforward. With the help of a lot of great friends on the West Coast, the plan was underway. 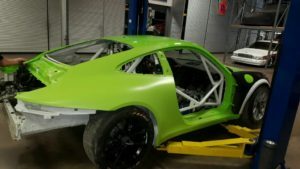 The Competition Motorsports squad was not the only one to step up and help the Kelly-Moss group get the car headed home for repairs. With the transportation and logistics plans coming together to get the car back to the shop, it was another new challenge to make some magic happen to get the Porsche properly repaired and turned back around in time to make the return trip West for the next round of the championship. While the goal for the drivers and teams is always victory, the Pirelli Cup USA environment is also one that features a lot of camaraderie among competitors, with an all-amateur format ensuring that everyone is as focused on being fast as they are on having fun. That competitive camaraderie has seen the West Coast oriented series grow every year. Pirelli GT3 Cup Trophy USA will be back in race action at Mazda Raceway Laguna Seca June 3-5.